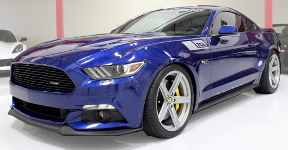 The 2016 Saleen Mustang continues the performance tradition of the S302 normally aspirated White Label with Saleen 302 Styling Package, supercharged Yellow Label with Saleen 302 Styling Package, and the ultimate supercharged Black Label model with Saleen 302 Signature Series aerodynamics. Other Saleen features include Saleen suspension, Saleen wheels and brakes, Saleen interior, and Saleen badging and graphics. Nice top view of a 2016 Saleen Yellow Label Mustang in Deep Impact Blue exterior paint. The Yellow Label Saleen includes the Saleen 302 Styling Package (hood, grille, rear spoiler, and rear taillight panel) along with a 715hp Saleen supercharger. Other Saleen features include Saleen suspension, Saleen wheels and brakes, Saleen interior, and Saleen badging. This example has the optional Carbonite 20 inch 5-spoke alloy wheels, yellow painted calipers, and dimpled rotors.